After contacting a few antique dealers we have discovered the MIL's most prized possessions aren't really worth much. The average price is an auction estimate of around £30-40 per item. Obviously you have to bear in mind that at auction things can go higher and lower, so its a bit of a risk. The weirdest situation for me is around the antique toaster. The auction houses can't sell it because its electrical !! Its due to health & safety regulations. What the !?!?!?!? This toaster was made in the early 1950's, I think, because the only model I've found so far is in a museum. I think health & safety has gone barmy in this country. What am I supposed to do with it? It's in excellent condition and with the original box. Surely no one would buy a 1950's toaster to use? It would be a kitchen feature or something? 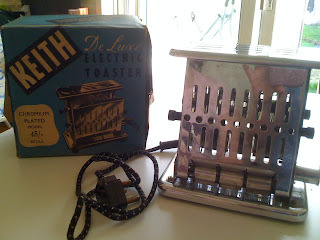 So I am left with a lovely vintage toaster that's only fit for scrap, what a shame.